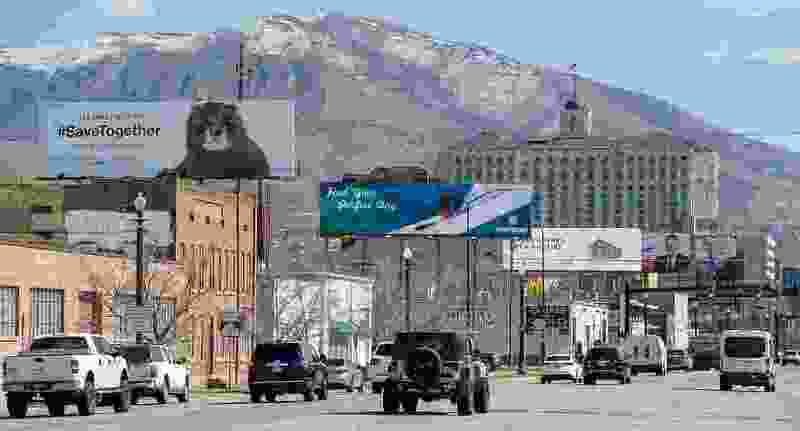 (Francisco Kjolseth | The Salt Lake Tribune) Billboards are stacked along the 600 South offramp from I-15 in Salt Lake City on Tuesday, March 13, 2018. Gov. Gary Herbert on Tuesday signed HB361, legislation sought by the billboard industry. The governor’s approval was the final one needed for the measure giving sign companies greater leeway to install digital signs and relocate old ones. HB361 was fiercely opposed by cities until it was amended late in the session to give them more time to value and relocate billboards. The governor has accepted $33,755 in donations of cash and free or discounted sign space from Reagan Outdoor Advertising since 2016 — most of that in during his last re-election campaign. A spokeswoman earlier told The Tribune there was “no correlation” between his decision on the legislation and campaign contributions he received. The company is one of the state’s biggest political donors and gave nearly $80,000 to lawmakers in the last election. A Tribune analysis found that those who received Reagan donations were far more likely to have voted for the bill than those who did not take contributions. Legislation to help billboard companies — giving them greater leeway to install digital signs and relocate old ones — passed through the House and Senate with overwhelming support. It probably didn’t hurt that one of Utah’s biggest billboard companies is also one of the most politically active businesses in the state, and among legislators’ most generous campaign donors. Reagan Outdoor Advertising (ROA) gave nearly $80,000 to 75 of Utah’s 104 lawmakers in the last election year, 2016. The Salt Lake Tribune reviewed the donations with an eye toward seeing if there was a correlation between campaign contributions and votes for or against HB361. The donation gap is more pronounced in the Senate, where the lone member voting against the measure, Sen. Jim Dabakis, took nothing from ROA (or any other corporation or political action committee, for that matter). The average for those voting yes was $1,388, based on overall contributions of $34,700 to those 25 senators. After blasting through the Legislature with just 10 dissenting votes, HB361 now lands on the desk of Gov. Gary Herbert. The governor has raked in $33,755 in donations of cash and free or discounted sign space from ROA in the same 2016-18 period. The analysis of contributions and legislative votes revealed similar results to one The Tribune conducted last month on HB169, a proposal to give low-level radioactive waste company EnergySolutions a $1.7 million break on state fees. Lawmakers generally deny that donations influence their decision-making. In fact, many say they are unaware of who their contributors are. Two supporters of the billboard legislation who responded to Tribune inquiries denied campaign checks carried any weight. Instead, they said amendments to the original city-opposed bill reflected a compromise between the outdoor advertising industry and local government. Sen. Todd Weiler, who took $1,700 from ROA, echoed this view and pointed to a revised 180-day deadline to approve a billboard valuation and relocation. That was a big change from the 90-day deadline in the original bill that cities said was impossible to meet and that would give sign companies almost unfettered power to relocate signs wherever they wanted. “Reagan asked me to please pass HB361 with only 90 days for the city to condemn the billboard,” said Weiler. “After I finished hearing from Reagan, I reached out to representatives from [the Utah Department of Transportation], Salt Lake City, Woods Cross City and Farmington City. During those conversations, I determined that 90 days was way too short of a time period. On the Senate floor, I amended the bill to double that to 180 days. A Reagan Outdoor Advertising spokesman said its donations are not made in an attempt to influence policy or legislation. “We donate because we believe it’s the right thing to do, we’re in a position to do so, and we think it’s in the public’s interest to do so,” said Nate Sechrest, an ROA lobbyist. Political scientists say the relationship between politicians and donors is more nuanced than may appear on the surface. “When [lawmakers] know that they have benefited from companies’ help in the past and may need it again in the future, it means that those companies get heard in the legislative process in ways that individuals or groups of citizens who have not donated regularly do not,” said University of Utah political scientist Matthew Burbank. Buying access may not be the same as buying a vote, but it does give donors a leg up on swaying legislators’ views. “There is no doubt that campaign contributions do provide, or buy, access, and access is influence that can be used by a donor to sway a legislator’s opinion in support or opposition to an issue,” said Chase Thomas, policy and advocacy counsel for the left-leaning nonprofit Alliance for a Better Utah. Regardless of the relationship between donations and voting, the issues surrounding outdoor advertising are not going away anytime soon. HB361 ended up with amendments that cities said they can live with for the time being, said Cameron Diehl, Utah League of Cities and Towns executive director. “It is a stopgap bill to address some immediate process issues with understanding that local governments and the billboard industry are going to work together to address this interim,” Diehl said.